Last month, AMD announced the Radeon RX 500 series graphics cards. This “new” graphics card lineup is basically a refresh of the RX 400 series GPU released last year. One can say that the RX 580 is just the same card as the RX 480 released last year; but features a fresh new look, design and slightly different clock speeds. Today, we are going to look at and review the XFX RX 580 GTS Black Edition 8GB. XFX released several variants of the RX 580. The GTS variants sit somewhere in the middle of their lineup; while the GTR variants have the higher clock speeds out of the box. It’s not the fastest and it doesn’t have any LED lighting, but it’s not the slowest right out of the box as well. So, who is the RX 580 for? Do you currently own an RX 470/480? Should you upgrade to the RX 580? Is the RX 580 better than the GTX 1060? And which one should you get? These are just some of the questions we will try to answer in this review. Please continue reading our XFX RX 580 GTS Black Edition 8GB review below and find out. The “new” Radeon RX 580 is based on AMD’s 4th generation Graphics Core Next (GCN) and features a 14nm Polaris 10 GPU; supporting AMD’s LiquidVR technology, Asynchronous Compute, DirectX12, Vulkan, and obviously AMD FreeSync technology. But wait! Isn’t the RX 480 built with the same GPU? Yes it is! That’s why the RX 500 series is a refresh of the RX 400 series; bringing new models and more or less a slightly bit faster performance from its predecessor. The new Radeon RX 580 graphics cards, isn’t really intended as an upgrade for the existing RX 480 and even RX 470 users. The difference on the performance between the RX 580 and RX 480 is very little to none at all (depending on the clock speeds). Instead, the RX 580 is intended for people who currently owns a much older and slower graphics card(s); and wants to play at 1080p or 1440p resolutions without spending beyond $300 USD. The RX 580 is also the direct competitor of NVIDIA’s GTX 1060, and you’ll find out later which among the two cards is the better one. With the new RX 500 series, XFX introduced a new and fresh design and cooling solution as well. Some of XFX’s RX 580 variants features LED lighting, like their flagship GTR-S Black Edition. While the rest of their RX 580 don’t have any LED lighting but features an aggressive look and design, like the GTS Black Edition we have here. 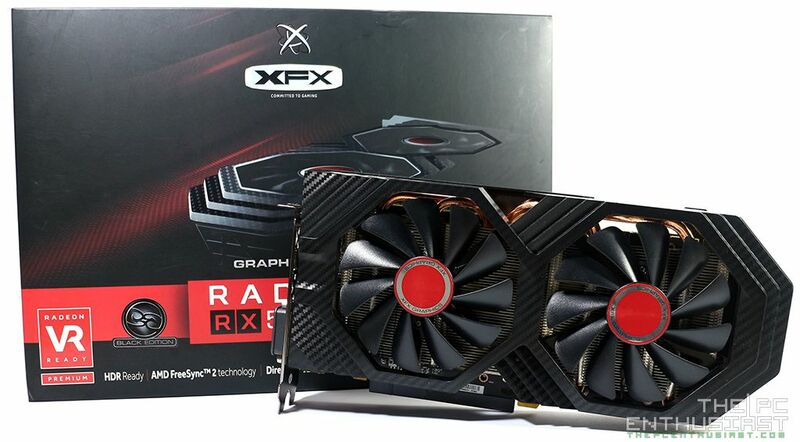 The XFX RX 580 GTX Black Edition features a (true) clock speed of 1405 MHz out of the box, and is guaranteed that you can overclock this card up to 1425 MHz with the OC+ feature, going beyond its true clock speed. That’s only a 20 MHz increase and whether or not it makes a difference you’ll see it on our synthetic benchmark results later. The XFX RX 580 GTS Black Edition is also loaded with several features and we’ll dissect them on the next page when we take a closer look at the graphics card itself. Below is a specifications table comparing the difference between the RX 580 GTS BE, the reference RX 580 and the older RX 480. After that, let’s proceed to the next page for a closer look.